Hmmm…what to do with an old bathtub? Add a little paint, a few colored bottles and a fabulous Virgin Mary, and wha la! 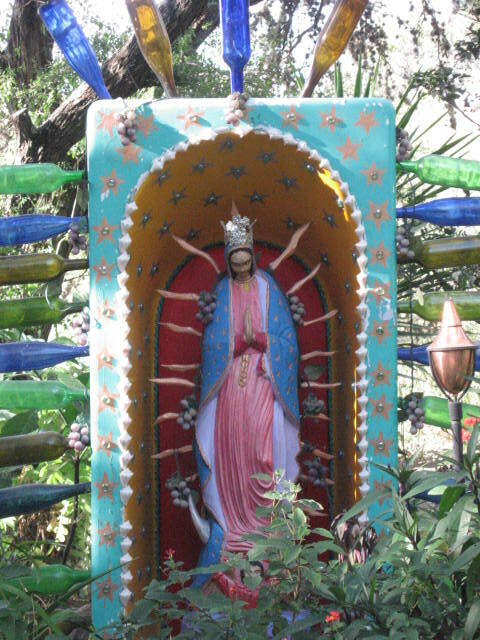 A shrine like no other graces the yard of artist friends near San Miguel. For more Virgin a Day, check out Rebecca’s site @ http://corazon.typepad.com/. ~ by Dawn Elliott on December 6, 2011. I would love to have this in my yard!!!!! wonderful! I’ve seen them in a tub before but the addition of the colorful bottles is beyond! thanks! This is wonderful!! and what a beautiful statue! what a wonderful and beautiful part of the world you live and move in where there is such a vibrant and real expression of soul spirituality! This one is grand beyond compare. So much more than Mary in a bathtub grotto. i always love this shrine at anada’s and look forward to returning to see him, and Her, when we go to san miguel for holy week. his chapel is nearly complete! he has been so busy with his passion play! Her crown is something else too…wow. Kentucky is well know for the Bathtub Mary’s. Love this for sure. I’ll have to check my pre-posts to make sure I don’t duplicate! ok – i love this one! speaks of ingenuity, making something with what you have, grand and bold in colour! 3 years ago my children and I were trying to determine what to use as a grotto for a garden shrine, this would have been brilliant! I love the glorious color!!!!!!!!!! All the color, the folk art, and the sacred ordinariness of your garden variety of bathtub. I wonder who the first person was to say, voila, bathtub, virgin. What do you do with an old bathtub? You marry the sacred and the profane! It is an amazing shrine and I think the colored bottles have a mythical quality of keeping away bad spirits. I love the bright paint on the tube. It’s beautiful!